While Chelsea Manning’s sentence being commuted is a gracious deed on the part of President Barack Obama, it doesn’t really signify a change in attitudes toward whistleblowers in the US, former CIA analyst and whistleblower John Kiriakou told RT. There’s a significant difference between commutation and a pardon, and it only means that Manning will be able to get out of jail in the near future, Kiriakou believes. “Manning wasn’t pardoned, she received a commutation. She’s still a convicted felon, she still can’t vote, she still can’t own a gun, she’s lost her federal pension. The only thing that has changed is that she’s going to come home in May,” Kiriakou told RT. The timing of the commutation is also not something extraordinary, since US Presidents usually tend to leave such actions for the very end of their terms. While President Obama’s deed is welcomed, one should not read too much into it, since there are many whistleblowers who should have been pardoned along with Manning. “It’s wonderful that Chelsea is being released, it’s well deserved. But this should not be seen as an across the board blanket amnesty or forgiveness on the part of this President,” Kiriakou said. Chelsea Manning’s case though, is rather exceptional, considering her extremely long sentence and various mistreatments she faced in custody. 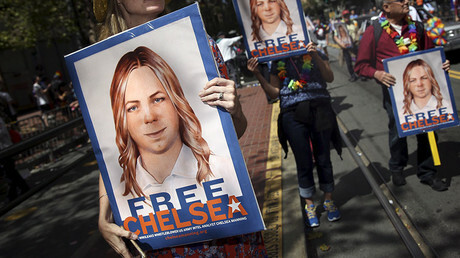 “I think frankly that Chelsea Manning is in for big things. Of course she’s going to need medical care, dental care in the immediate term, probably even psychological care. But in terms of getting her life back on track, I think she’ll be highly sought after speaker, I think she’ll write a book of her experiences and I think she will be welcomed with opened arms by her many many supporters across the country,” Kiriakou told RT. Nevertheless, Manning still has 5 months to stay in prison and actually has more to worry about the hostile environment than her health issues at the moment, Kirakou believes.